While Ferrari was busy building and racing cars in the 1950s, the factory found time to build luxury cars, which were truly in a class of their own. This by no means was a series production; on average only one of these was constructed each month. The first of these was the 342 America, first shown in 1952, fitted with a Touring styled body. The long block engine was derived from the 340 America sports racer, but the chassis was a bit longer to increase the interior space. Only six examples were produced, of which the Pinin Farina bodied examples are the most important. They were the first Ferraris bodied by the Turin based coach builder and started a strong collaboration that continues to this day. At the 1953 Paris Motorshow, two new road cars were displayed, both using Lampredi's 'long block' V12 engine. The smaller of the two was the 250 Europa and its big brother the 375 America. It shared its 4.5 litre engine with the marque's Formula 1 and sports car racers. This extremely powerful engine made the America the fastest luxury car in the world. With production of the chassis already limited, the coach builders made sure that every one received a custom body. 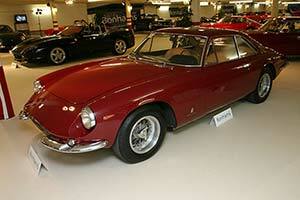 About ten were built during its two production years, with Pinin Farina bodying the majority of them. Two years after the 375 America's production, Ferrari again showcased a new luxury GT at the Paris show, but in chassis form only. Dubbed 410 SuperAmerica, the completed car made its debut at the Brussels Motorshow a year later. The Pinin Farina designed body resembled the 250 GT competition car. Compared to the smaller Ferrari, the 410 SuperAmerica's 2800mm long wheelbase was 200mm longer. Power came from Ferrari's largest engine to date, displacing just under 5 litres. It shared this engine with the 410 Sport, designed specifically for a number of South American road races. In competition form, the engine was good for at least 400 bhp and the 340-360 bhp available in the SuperAmerica was more than sufficient.